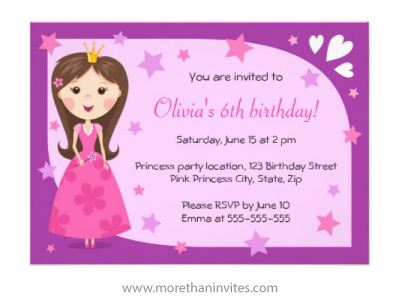 Cute and fun pink and purple princess birthday party invitation. The invite features a little princess cartoon girl with a crown and pink dress with flowers on a purple background and surrounded by pink and purple stars. Girly design for kids, great for princess themed birthday parties. 7″ x 5″ (landscape). Additional sizes available.